Sobek Rafting is the most famous rafting company in Bali. Having experience more than 20 years, this company has made â€‹â€‹a lot of ways to constantly improve and enhance the quality of the service. Despite having the same place or river rafting with other companies, but Sobek Rafting always try to give the best to make your holiday more enjoyable and will never be forgotten. Creating satisfied customers is the goal of the Sobek Rafting company. 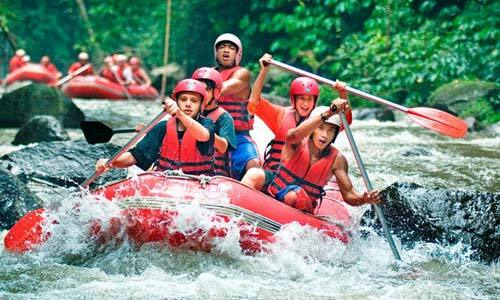 Here, you will be invited to navigate the Telaga Waja river with full of fun and excitement. Friendly guides will make every customer feel comfortable doing this activity. Enjoy all the fun in this activity with Sobek Rafting, which will always make your holiday is always keep in mind. Upon arrival in the location, you will be treated to appetizers beverages like coffee or tea and some snacks Balinese. Each participants are required fill out a form of insurance. After all filled, you will be invited to wear standard rafting equipment such as helmet, paddle, and life jacket. Waterproof bags will be supplied by the rafting guides and you are welcome to put items that you will take over the river. Before starting rafting, all participants will be briefed on the conditions around and some code that you must understand and follow during rafting. In the middle of your journey across the river Telaga Waja, you will be invited to stop for a moment to rest while enjoying the view of a beautiful waterfall. Green landscape of rice terraces around the river you can also enjoy the same time. Here is your chance to take a picture through your own camera to capture this incredible experience. Shortly before the finish wading Telaga Waja river, you will plunge altitude of approximately 3.5 meters which is often called the "Bajing Dam". It is the most awaited of this journey through the Telaga Waja river. You will scream loudly as it passes through this place. photographer of Sobek Rafting will always be ready to capture your images as it passes through this place. Change of clothes, Footwear / River sandals, Camera, Hat, Sun screen and cash.